Based on the Jeep Wagoneer, the Jeep Honcho was initially referred to as the Jeep Gladiator and was in production from 1962 to 1988. 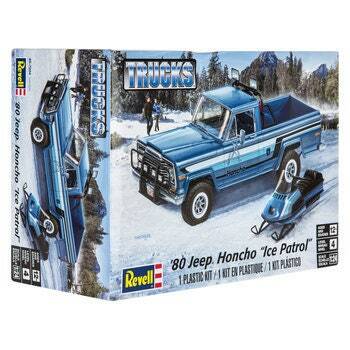 Create your very own scaled-down version with 1980 Jeep Honcho “Ice Patrol” Model Kit! This kit offers all the pieces necessary to build a Jeep with a detailed V8 engine, a 4-wheel drive system, and pickup bed extras like gas cans and a toolbox. Paint it how you see fit, and add to your collection!